Royal Obidos is a brand new course designed by the golfing legend Seve Ballesteros. Very sadly Seve died before he could see this new course come to fruition and he never struck a ball on this new course. It differs in almost every way to Praia D’El Rey (the other course I played when I was on holiday). The clubhouse has a Kevin McCloud Grand Designs feel and its elegance is in its simplicity. Downstairs are the locker rooms and rental area and upstairs the bar, pro shop and incredible glass fronted veranda. That's it, and that's all there needs to be in a clubhouse. Whilst we weren't on the beach and couldn't see any sand, the ocean was in view for about half the round. The round starts with a generous medium length par four before coming alive on the monstrous par five 2nd. Travelling over the road to face the lagoon side of the course this really was an almighty tee shot. In the early morning sunlight it really was a majestic tee shot, one that you want in every round. Other stand out holes on the front side were the 4th, a long par four requiring a very accurate second shot and the 7th a long par five with commanding views over the massive lagoon in nearby Obidos. There were plenty of great holes on the back nine, most notably the huge par five 10th with water. In fact water featured so prominently I lost seven balls, a record for about ten years I think. It must have come into play on about a dozen of the holes. Playing off the back tees perhaps wasn't the wisest choice but I wanted to experience it as Seve envisaged. It was a long track off the backs but worth every penny. The rest of the back nine was a very stern test with the last four holes being an absolute stunning set to finish the round with. The early bird discount meant that for two people the green fees were 99 euros with a buggy, real value for money. The service we received from the caddymaster, the pro shop and the restaurant staff was faultless. The restaurant had some of the best food we had on holiday at such great prices that when the bill came I was pleasantly surprised. You simply must stay after your round and try some of the authentic Portuguese dishes. It is too early to say how Royal Obidos will develop but with a new hotel planned and a clubhouse built to much more exacting standards than at Praia, this course really should be one to watch in the future. Seve would be proud! The course here is one that can be described as very well-conditioned and manicured with perfect putting surfaces and wicked run-offs around the greens, the style that can be seen regularly at European Tour events. If you add in eight holes that have water in-play and a number of great ‘risky’ shots, it is easy to see that the course has been created in the eye of the designer, the great Seve Ballesteros. The first hole for a mention is the 2nd a par-5 with trouble all of the way, probably too much if I am honest; the tee shot especially. There is a long carry over water to reach the fairway and for those who cannot make it, the fairway bail-out to the right is very narrow – negotiate this and then the lay-up and you are still approaching a semi-island green – there is no doubting Seve’s style lives on here. The par-5 5th is a strong hole, especially as you have a choice of attacking the green in two but the lay-up is the sensible play as there are four great bunkers about 50 yards short of the green. The 12th is another stand-out hole; very demanding off of the tee and you need to be precise and find the plateau of a fairway as anything leaking right will be wet - all carry for the approach which is likely to be a mid to long-iron. I am not a fan of the ultra-short 13th hole; uphill and around 140 yards and unable to see the green (I struggle to enjoy par-3’s when you cannot see the green and the hole). There is a little rest bite at the 16th and 17th in terms of no water to deal with but to the last; I am a fan of this closing hole in big way. It is a par-5, it is from an elevated tee, there are bunkers to deal with and then another semi-island green with bunkering beyond the green, this is all that a modern 18th should be – no weak finish here (courses in this group know who you are!). A visit to this region to include Prai De’l Rey, Bom Sucesso, CampoReal and Royal Obidos is a very strong tour indeed. A really good course, that I thoroughly enjoyed. Only downside was the construction noise on the first nine holes (are they building another 9 ?) and holes 16 and 17 which were a bit weak. But the rest was great. 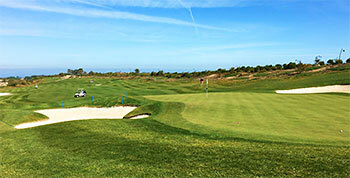 Royal Obidos is a must play if you are holidaying in this area. Much preferred it to Praia D'el Rey, and the greens amongst the best I have ever played. A challenging course with holes 2, 4 and 7 a driver's delight. Strong finish with 16, 17 and 18 sporty and strategic. Money has been thrown at the project with a delightful clubhouse, many helpful staff and high standards of green keeping. Play if you can! From the road, Royal Obidos looked likely to be a typical 'modern' course which whilst having plenty of water otherwise may have been pretty featureless. Based on this i was extremely reticent to play the course and was much more in favor of another day surfing or another round at Praia del Rey. How wrong could i have been.... everything about Royal Obidos is pure class; an excellent challenging course course in fantastic condition, particularly the greens; a superbly designed clubhouse which is a pleasure to get changed in and food served of the highest standard. Every detail is taken care of at Royal Obidos. In my view the course was far superior to Praia del Rey, which is also an excellent course. I do have some advice however; consider getting a buggy, we walked the course and we certainly knew about it afterwards. Played the course twice this summer, and i loved every minute of it. Great clubhouse very pleasant staff. Worth every penny.